This is the Motorola Droid Turbo - Motorola's strongest claim at the high-end throne yet. Built around the strong foundation of the Moto X (2014), Nexus 6 and Motorola's previous Droids it pools together a premium build, pure Android with exclusive features and impressive battery life. The Motorola Droid Turbo is everything we were hoping for with a 5.2" display of QHD (1,440x2,560px) resolution and massive 565ppi density, a top of the line Snapdragon 805 chip, 3GB of RAM, 21MP main camera. To add a bit of character the Droid Turbo comes in Ballistic nylon or Metalized Glass fiber reinforced with DuPont Kevlar fiber and a water-repellent nano coating. Motorola is going for the gold this year. It brought us a new, truly flagship Moto X, its first Nexus (which braves crowded phablet realm) and now it tops both (in a way) with the Motorola Droid Turbo. And while "turbo" monikers are outdated, the word perfectly describes the fire-breathing nature of this device. What the Moto X (2014) lacked, the Droid Turbo has in reserve. Snapdragon 801 is still worth its salt nowadays but Snapdragon 805 is the new champ. Motorola isn't taking its chances with mediocre battery life here - the potent 3,900mAh capacity promises insane, Droid Maxx-worthy longevity. 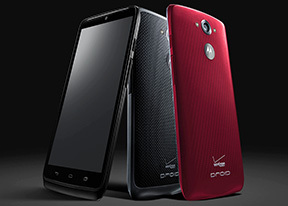 The Motorola Droid Turbo comes with nearly stock Android, ensuring a snappy performance. It should offer timely updates (that is if Verizon obliges), but it's starting a lap behind the Nexus family with 4.4 KitKat out of the box. There's every chance that the Droid Turbo might sway Moto X (old and new) onlookers and shift their affections towards Turbo's direction. Hopefully Motorola won't keep the Droid Turbo confined to just one carrier in one country, otherwise they will be left with just looks of envy. Wishes not withstanding, the Motorola Droid Turbo will make its way exclusively to Verizon customers starting October 30. It will cost $199.99 for the 32GB and $249.99 for the 64GB with a two-year commitment. There will also be a monthly option at $25 or $27 per month on Verizon Edge, respectively. The 32 gig model will come in Metallic Black, Metallic Red, and Black Ballistic Nylon while the 64GB will launch only in Nylon garbs. Now we need to show you the Motorola Droid Turbo and believe us, you want to see it. Next up is a look at the hardware. Is otg is capable of reading 1TB external hard drive for moto turbo. And of yes share the the specification of that cable. Always liked Motorola for some reason..was my first half way decent cellphone (original razr) then I went to Nokia for their great camera phones. Nice to see that Motorola is FINALLY being competitive with their phone cameras.